I quit smoking once and didn't have any withdraw symptoms. I am going to quit within a week. Hope I dont get any this time. Nicotine Detox Reply: I think the expected agony of going through withdrawal symptoms is what keeps a lot of smokers from quitting. That said, if you smoke, the best thing you can do for yourself is to quit. While you are in the process of quitting, however, it would be advisable to take a Vitamin C supplement. This isn't going to help with the withdrawals much but it will help with neutralising the free-radicals. Smokers break down vitamin C faster than non-smokers and therefor need far more. 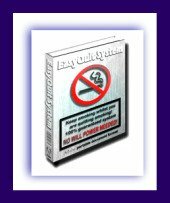 Infact due to the increased exposure to "reactive oxygen species" (a free radical), it is recommended that smokers should try to increase their intake of anti-oxidants. It sure may feel like it, but quitting smoking is not an insurmountable feat. Millions have done it either by sheer will-power, nicotine replacement treatments, slowly weaning themselves, medications, herbal blends or alternative therapies such as hypnosis.